In 2004, The Killers released Hot Fuss and became one of the most notable names in alternative rock. The album mixed new wave influences with early 2000s edginess, and everyone loved it—especially its catchy singles “Mr. Brightside” and “Somebody Told Me.” Eventually, Hot Fuss would come to be named one of Robert Dimery’s “1001 Albums You Must Hear Before You Die” and Rolling Stone’s “100 Greatest Debut Albums of All Time.” When it first came out, though, it was simply new, exciting music with no prestige attached, and people enjoyed it for what it was—11 tracks’ worth of emotion and energy. When The Killers announced that they would release a follow-up to their nearly-perfect debut, fans were elated. On October 2nd, 2006, the long-awaited gift arrived… and listeners had mixed reactions. Perhaps the most frequently voiced criticism of Sam’s Town was that the album was not Hot Fuss: The Sequel. Indeed, it was a fairly different entity. Instead of instant hit like “Mr. Brightside,” the second track on the album was a 50-second piano ballad; instead of artsy pink signs glowing against a clear blue sky, the cover depicted a ram sitting in front of a wall with a shoddy paint job. That doesn’t mean Sam’s Town wasn’t a stellar album, though—because it was, and it still is. 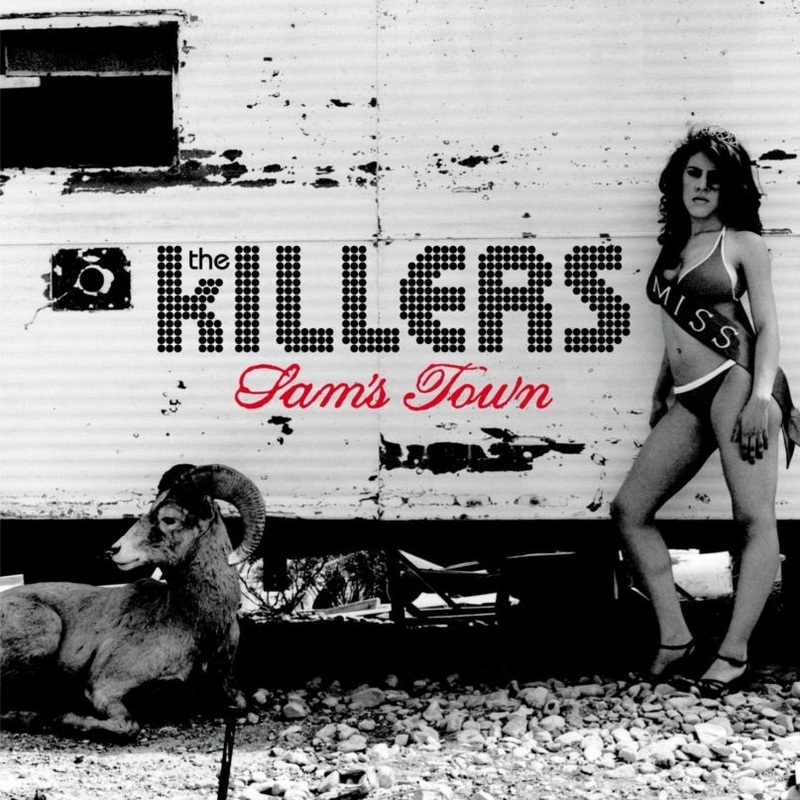 Sam’s Town is an experiment in storytelling that shows the band’s evolution without abandoning the innovative lyrics and daring impetus that initially made The Killers a household name. Ten years later, it remains a work of art, the kind that inspires you to embrace every victory and failure you’ve ever had and search for rays of sunlight in dusty skies. The album’s first song—the title track—begins with an epic drum-fueled crescendo. When Brandon Flowers starts to sing, the track transforms into a masterpiece that sounds like the opening number to a fantastic rock musical, complete with sparkling synthesizers and glorious guitar riffs. It’s not hard to imagine Flowers spinning and jumping between scenes on a stage as he cries, “Why do you waste my time?”, his voice rising to the rafters and back down again. The lyrics speak of everything from funerals to birthdays, encapsulating a soul-searching spirit that puts the listener in the right mindset for the rest of the album. Next up is “Enterlude,” the aforementioned 45-second piano ballad. If “Sam’s Town” didn’t warm you up to the album, this one will; after Flowers sings “We hope you enjoy your stay/It’s good to have you with us/even if it’s just for the day,” you can’t help but eagerly wonder what that stay will entail. The next two tracks, “When You Were Young” and “Bling (Confession of a King),” are some of the album’s most triumphant moments. The former features a stunning instrumental section, boasting everything from gloriously layered guitars to an intense bass-line to passionate percussion to pensive synthesizers. Its lyrics, which speak of the tension between a girl’s feelings toward a man and her childhood expectation of a knight in shining armor, are also some of the Killers’ best work, playing with uncertainty and irony. “Bling” evokes the grand sound of War-era U2 with emotive, questioning verses, a suspense-building bassline, and guitar riffs that hit their mark like lightning bolts. “Read My Mind” is another standout. Musically, it sounds like a timeless ’80s classic well-suited for blissful singalongs. Lyrically, it presents Flowers as a character who “never really gave up on/breaking out of [his] two-star town,” making him easy to root for. Then it barrages the listener with a series of images that glisten like stills from a movie, from “a broken wrist and a big trapeze” to “a city wall and a trampoline.” When the tribute to self-sacrificial love concludes, “the stars are blazing like rebel diamonds” and the Killers have proven their expertise at crafting beautiful love songs that are far from banal. “Uncle Jonny,” the following track, is also stellar. One might call it the “Andy, You’re A Star” of Sam’s Town. Both songs open with a distinctive riff; both are character sketches of troubled people; both have a dark tone. However, “Uncle Jonny” is distinct because of its hopeful undertones. Whereas “Andy” is a jab at someone who mocked Flowers in his youth, “Uncle Jonny” focuses on a relative who is struggling with an addiction, and while it does stress the sad futility of titular uncle’s ways, it also shows Flowers’s belief that Jonny will ultimately find help. During the chorus, Flowers’s falsetto quivers with contagious emotion; near the end of the song, when he employs the lower end of his range for backing vocals, his sincerity is just as tangible. Of course, the spoken part in the song is also well performed; when Flowers shouts, “Hey, Jonny, I got faith in you, man! I mean it! It’s gonna be all right!”, his voice packs the force of a punch but cracks just enough to show his vulnerability, a wise artistic choice. What an apt closing lyric. It’s always good to have the Killers with us, whether they’re singing “Mr. Brightside” or not.